Explore the numerous day-trip ideas around Venice: Padua (Scrovegni Chapel & Basilica di Sant’Antonio). The adventure continues: contemplate the waterfront views at Canal Grande, enjoy breathtaking views from St Mark's Campanile, see the interesting displays at Museo Ebraico di Venezia, and pause for some serene contemplation at Basilica di San Marco. To find other places to visit, photos, reviews, and other tourist information, use the Venice trip itinerary website . Reykjavik, Iceland to Venice is an approximately 9.5-hour flight. You can also do a combination of flight and train; or do a combination of flight and train. You'll lose 1 hour traveling from Reykjavik to Venice due to the time zone difference. Traveling from Reykjavik in January, expect nights in Venice to be about the same, around 0°C, while days are somewhat warmer, around 9°C. Finish your sightseeing early on the 23rd (Wed) to allow enough time to travel to Naples. Naples is the capital of the Italian region Campania and the third-largest municipality in Italy after Rome and Milan. Explore the numerous day-trip ideas around Naples: Salerno (Cappella Santa Maria Delle Grazie Salerno, Chiesa San Pietro a Corte, & more). There's lots more to do: delve into the distant past at Gli Scavi Archeologici di Pompei, examine the collection at National Archaeological Museum of Naples, pause for some serene contemplation at Cloister of Santa Chiara, and don't miss a visit to Miglio Sacro. To see ratings, other places to visit, reviews, and other tourist information, read Naples road trip planning tool . You can fly from Venice to Naples in 4 hours. Other options are to do a combination of flight and train; or drive. Traveling from Venice in January, expect Naples to be somewhat warmer, temps between 15°C and 6°C. Wrap up your sightseeing on the 28th (Mon) to allow time to drive to Praiano. Praiano is a town and comune of the province of Salerno in the Campania region of southwest Italy. Venture out of the city with trips to Amalfi (Torre dello Ziro, Sanctuary of Our Lady of Sorrow (Sancturio Maria Santissima Addolorata), & more), Liquorificio Mansi Carlo (in Minori) and Chiesa di San Francesco (in Maiori). And it doesn't end there: have fun at Tennis Al Settimo Piano, stop by Theodora Moda Positano, Head underground at Grotte di Suppraiano, and take in the spiritual surroundings of San Giovanni del Toro. For more things to do, where to stay, and more tourist information, read Praiano driving holiday site . Drive from Naples to Praiano in 1.5 hours. Alternatively, you can do a combination of subway and taxi; or take a bus. Traveling from Naples in January, plan for a bit warmer nights in Praiano, with lows around 10°C. Cap off your sightseeing on the 1st (Fri) early enough to travel to Rome. Rome is known for historic sites, nightlife, museums, classes, and shopping. Your plan includes some of its best attractions: delve into the distant past at Colosseum, contemplate the long history of St. Peter's Basilica, wander the streets of Trastevere, and get to know the fascinating history of Piazza Navona. For ratings, photos, and more tourist information, use the Rome sightseeing planner . You can do a combination of taxi, subway, and train from Praiano to Rome in 3 hours. Alternatively, you can drive; or take a bus. Traveling from Praiano in February, expect little chillier with lows of 5°C in Rome. Finish up your sightseeing early on the 6th (Wed) so you can catch the train to Florence. Florence is known for museums, historic sites, shopping, nightlife, and parks. Your plan includes some of its best attractions: admire the masterpieces at Uffizi Galleries, take an in-depth tour of Basilica di Santa Croce, see the interesting displays at Pitti Palace, and take in the spiritual surroundings of Cathedral of Santa Maria del Fiore. For reviews, maps, traveler tips, and other tourist information, refer to the Florence visit planner . You can take a train from Rome to Florence in 2 hours. Other options are to drive; or fly. 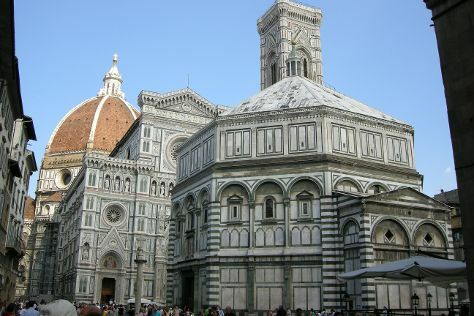 In February, daytime highs in Florence are 14°C, while nighttime lows are 5°C. Wrap up your sightseeing on the 9th (Sat) early enough to take a train to Milan. You'll find plenty of places to visit near Milan: Santuario Della Madonna delle Grazie di San Martino (in Griante) and Parrocchia SS Nabore e Felice (in Cadenabbia di Griante). There's much more to do: pause for some serene contemplation at Duomo di Milano, test your team's savvy at La Casa Maledetta, explore the galleries of Castello Sforzesco, and stroll the grounds of Monumental Cemetery. To find out how to plan a trip to Milan, use our trip itinerary maker. Take a train from Florence to Milan in 2 hours. Alternatively, you can drive; or take a bus. In February, Milan is a bit cooler than Florence - with highs of 10°C and lows of 1°C. Finish up your sightseeing early on the 12th (Tue) so you can travel back home.